ENG: An eventful week is just behind us now, full of exciting experiences, many events, shows and a lot of hustle and bustle. All three of us went to the capital from Monday to Friday, where we were allowed to stay in the beautiful Hotel de Rome. The hotel is the perfect address during Fashion Week, because many events are in walking distance and the service is just amazing. We were mostly out and about with our beauty partner Catrice Cosmetics, who is also the main sponsor or the Berlin Salon and was responsible for the make-up there, too. The Berlin Salon definitely separates itself from other events with shoes and presentations from amazing designers such as William Fan, Odeeh, Perret Shaad or even Marina Hoermanseder. In addition to that we also had a group presentation at the beginning of Fashion Week again, where the participating partners were able to show parts of their collections beforehand. Catrice Cosmetics were the main sponsor of this event as well, which is why they were responsible for the makeup here, too. I hope that you got loads of impressions and backstage-insights through my Instagram-Stories already! Other than that, the wedding planning costs us both time and nerves – it’s really incredible how many decisions have to be made and details determined, and that even though we do have a wedding planner already! Are you interested in the topic ‘wedding’ and would like to be kept up-to-date on this? New In: I definitely sinned the last week and ordered incredible Balenciaga Heels that were on sale, and in addition to that, the Balenciaga Speed Sneaker in blue will arrive at my door today. I still have no idea why sneakers in blue just spoke to me as much, but I already have a combination of a white summer dress and blue jeans underneath that in mind. Our pink Fluente Sofa also has been added too, and makes a perfect and comfortable seating area with a matching armchair. 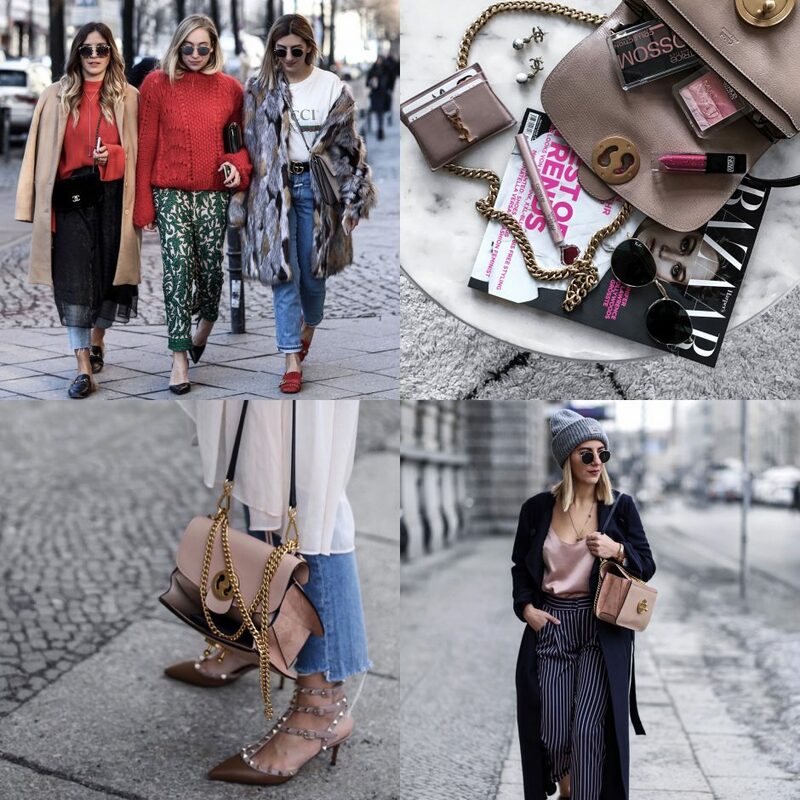 Wie ihr vermutlich mitbekommen habt, war ich während der Fashion Week in Berlin unter anderem mit CATRICE Cosmetics unterwegs, die als offizieller Make-up Partner und Sponsor vom BERLINER MODE SALON fungierten. Ich habe dadurch die Chance erhalten auch Backstage hinter die Fassaden einer Fashion Show zu schauen, was immer sehr spannend und bei jeder Show anders ist. CATRICE war die komplette Woche für das Make-Up und die inspirierenden Beauty Looks der Models in Person von Loni Baur, einer deutschen Visagistin, zuständig. Ich habe die Shows von Malaika Raiss, Julia Seemann, Odeeh, Antonia Goy, Marina Hoermanseder sowie meine absolute Lieblingsshow von William Fan besucht. Schon in Paris im letzten September war ich gemeinsam mit CATRICE bei der Kaviar Gauche Show und habe auch dieses Mal sehr viele positive Eindrücke mitgenommen. Laura und ich hatten am letzten Dienstag den Instagram Account von CATRICE übernommen, um euch Einblicke von den Shows, Backstage-Eindrücke und den jeweiligen Make-Up Look der Designer live zu zeigen. ENG: As you have maybe recognized via Instagram or Snapchat, I was part of the GRAZIA Pop-Up breakfast during the Berlin Fashion Week. Before we were heading to the event location, I have received the winner from the GRAZIA competition in order to drive with them together to the Grosz restaurant with the Mitsubishi shuttle. From 9 am on lots of invited guests gathered there for starting into the day with an excellent breakfast. The actual highlight that day was outside at the entrance area in terms of the Mitsubishi Space Star, that can be equated with the perfect „city speedster“ based on its compact size and the great technical equipment. After four hours of interesting and positive conversations as well as a saturated stomach, I headed back with the cool Mitsubishi shuttle to the Hotel de Rome, where I could sleep the whole Fashion Week. My outfit that day consisted of a conspicuous, stripped blouse with wide sleeves, a simple Closed jeans, an oversized coat from Joseph, gold colored GUCCI shoes as well as a velvet bag, also from GUCCI. A picture is worth a thousand words, so that enjoy the following impressions from the fantastic event. 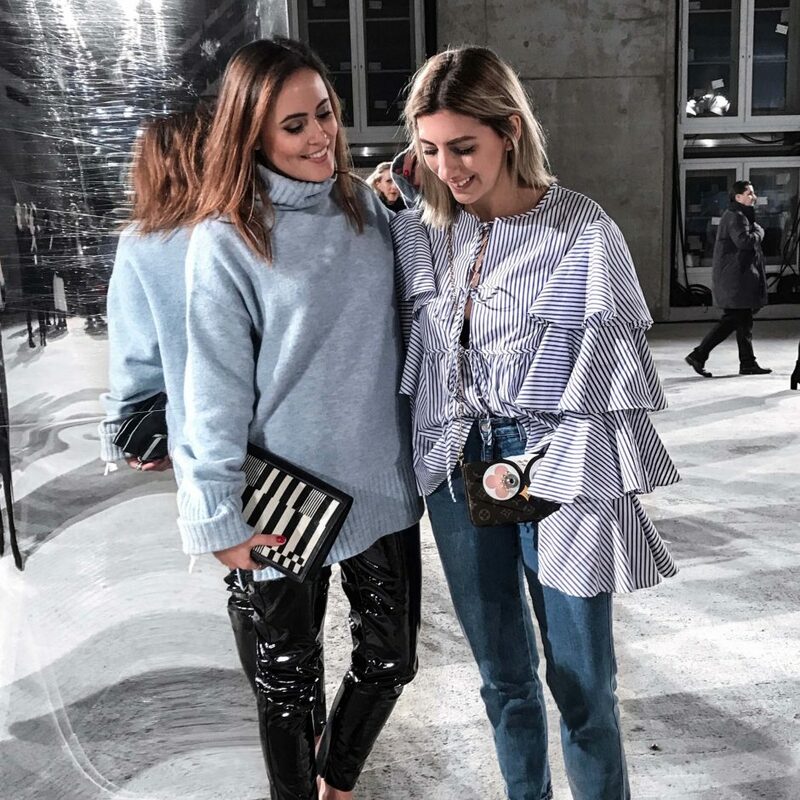 ENG: Based on the fact, that I have been to Berlin for the Fashion Week during the last days, there was just too left time for writing a weekly focus but today I would like to catch up on it in a more extensive way. The Fashion Week was really brilliant but rarely such exhausting with regard to several obligations and appointments. Together with Laura we have made a cool film in my opinion, it was a lot of fun and hopefully you are similar thrilled like me. New In: Based on the fact, that my boyfriend and me will spend a lot of time on the road in the near future, we have decided to buy a Rimowa suitcase, that seems to have a very high quality. In addition to that I have got these lovely gold colored Gucci Marmont shoes as a result from my first collaboration with Net-A-Porter. A further eye-catcher is this dreamful blanket from LOEWE, that I will combine certainly several times during the next days when regarding the pretty cold temperatures. I have not worn a CLOSED jeans so far but after getting this trousers with its perfect fit, I was so impressed, that I just had to get a second one of it. 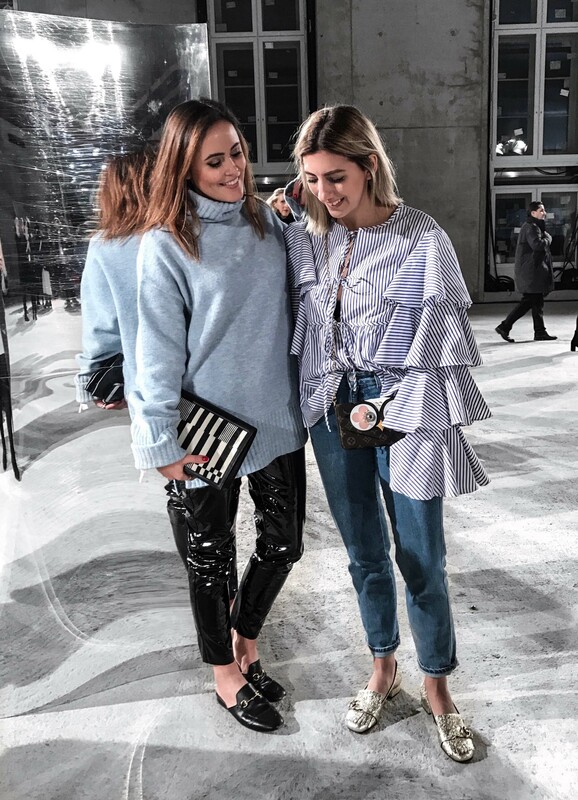 At Topshop I have ordered a patent leather trousers in red, at Edited however I have fallen in love with the new SS17 collection and decided there for a rose colored oversized coat, this baby blue oversized jumper as well as a rose-hued tulle skirt. ENG: WOW – a very exciting week draws to a close, I was allowed to visit cool shows and events complemented by wonderful conversations in Berlin. I am pretty happy about the last few days and of course I have taken the opportunity to shoot some of my Fashion Week outfits, of which I would now like to introduce the first one. In this case I am wearing a whole H&M look added by my beloved Valentino Rockstud heels as well as the beautiful Chloé bag from Net-A-Porter. Layering looks are still very stylish from my point of view and it is almost every time the perfect combination for cold temperatures. For me a casual and suited to daily use street style look, that definitely belongs to my favorites during the last few days. What do you think – Do you like this outfit as well? Have a cozy Sunday.